We studied the impact of Roux-en-Y gastric bypass (RYGB) on the density and hormonal gene expression of small-intestinal enteroendocrine cells in obese patients with type 2 diabetes. Twelve patients with diabetes and 11 age- and BMI-matched controls underwent RYGB followed by enteroscopy ~10 months later. Mucosal biopsies taken during surgery and enteroscopy were immunohistochemically stained for glucagon-like peptide-1 (GLP-1), peptide YY (PYY), cholecystokinin (CCK), glucose-dependent insulinotropic polypeptide (GIP) and prohormone convertase 2 (PC2) and the expression of GCG (encoding preproglucagon), PYY, CCK, GIP, GHRL (encoding ghrelin), SCT (encoding secretin), NTS (encoding neurotensin) and NR1H4 (encoding farnesoid X receptor) was evaluated. The density of cells immunoreactive for GLP-1, CCK and GIP increased in patients after RYGB and the density of those immunoreactive for GLP-1, PYY, CCK and PC2 increased in controls. In both groups, GHRL, SCT and GIP mRNA was reduced after RYGB while PYY, CCK, NTS and NR1H4 gene expression was unaltered. GCG mRNA was upregulated in both groups. Numerous alterations in the distribution of enteroendocrine cells and their expression of hormonal genes are seen after RYGB and include increased density of GLP-1-, PYY-, CCK-, GIP- and PC2-positive cells, reduced gene expression of GHRL, SCT and GIP and increased expression of GCG. The online version of this article (doi: 10.1007/s00125-015-3696-3) contains peer-reviewed but unedited supplementary material, which is available to authorised users. Roux-en-Y gastric bypass (RYGB) is a widely used weight-reducing surgical procedure  that also improves glucose regulation in individuals with impaired glucose homeostasis within days after the procedure . These improvements are thought, at least in part, to be the result of RYGB-induced rerouting of nutrients, which in turn is thought to alter the secretion of several gut-derived hormones. Little is known about the effect of RYGB on the distribution of gut-hormone-producing cells, and the postoperative expression of their hormonal products remains unexplored in humans. In this study, we evaluated the changes in density and gene expression of several enteroendocrine cells after RYGB in obese participants with and without type 2 diabetes. Anthropometric data is shown in electronic supplementary material (ESM) Table 1. Twelve obese participants with type 2 diabetes and 11 age- and BMI-matched normoglycaemic participants referred to elective RYGB participated in the study. All gave informed consent and the study was carried out in accordance with the Declaration of Helsinki. The participants with type 2 diabetes had been diagnosed with diabetes for 7.0 ± 1.6 (mean ± SEM) years and were all on oral glucose-lowering agents and/or insulin at the time of inclusion. On experimental day 1, all participants underwent RYGB using standard laparoscopic RYGB technique as previously described . During the RYGB procedure, a 1 cm segment was excised from the jejunal division site (proximal end) and designated area A. Some mucosal biopsies were placed in RNAlater (Life Technologies, Carlsbad, CA, USA) while others were placed in 4% formaldehyde,. On experimental day 2 (≥4 months after RYGB) after 8 h of fasting, an upper enteroscopy was performed in sedated participants using a colonoscope (PCF-Q180AL; Olympus, Tokyo, Japan). Nine mucosal biopsies were taken from each of three different anatomical locations (the alimentary limb, the common limb and the biliopancreatic limb), designated areas B, C and D, respectively. The biopsies were placed directly in RNAlater and 4% formaldehyde, respectively. The number of all immunopositive enteroendocrine cells was counted, providing an estimate of enteroendocrine cell density (i.e. number of cells per mucosal area). For a detailed description of immunohistochemical staining, cell quantification and estimation of cell length, see ESM Methods. For details of RNA purification, cDNA synthesis and quantitative PCR (qPCR) analysis, see ESM Methods. For a summary of primers used in qPCR, see ESM Table 1. Main effects of group, RYGB surgery and post-surgery biopsy site were investigated using a multi-factorial ANOVA test performed in SAS version 9.1 (SAS Institute, Cary, NC, USA) with the mentioned factors included as independent variables. When significant main effects were observed in the ANOVA model, data were investigated further using post hoc Student’s t tests. Statistical significance was accepted at p < 0.05. Immunohistochemical cell quantification data are presented as mean ± SEM and qPCR data are presented as log10-transformed mean ± SEM. The mean time (± SEM) between RYGB and enteroscopy was 10.4 ± 0.8 months. BMI on day 1 was 40.1 ± 1.4 kg/m2 and 39.0 ± 1.3 kg/m2 in controls and type 2 diabetes patients, respectively (p = 0.465) and weight loss on day 2 was 29.4 ± 1.4 kg and 27.0 ± 3.7 kg, respectively (p = 0.531). Changes in demographic and biochemical variables are displayed in ESM Table 2. Results from multi-factorial ANOVA are displayed in Table 1. Specific results are commented on below but generally there was an effect of RYGB and very few effects between groups and sites. We observed significantly higher expression levels of GCG (encoding preproglucagon) and density of glucagon-like peptide-1 (GLP-1) immunoreactive cells after RYGB surgery. Post hoc t tests showed these effects to be present in both groups (Fig. 1a, b). The ANOVA model showed that although RYGB had no effect on the expression of PYY there was a significantly higher number of peptide YY (PYY)-positive cells after RYGB. A significant postoperative increase in the density of PYY-positive cells in the alimentary and biliopancreatic limbs was shown by t tests, but these differences were only observed in the control group (Fig. 1c, d). We saw no effects of surgery on CCK expression but there was a significantly higher cholecystokinin (CCK)-positive cell count after RYGB. Post hoc t tests showed that this effect was present in both groups (Fig. 1e, f). We observed significantly lower GIP mRNA levels after RYGB, but the post-surgery density of glucose-dependent insulinotropic polypeptide (GIP)-positive cells was significantly higher. Post hoc t tests showed significant downregulation of GIP mRNA in all post-surgery biopsy sites in both groups but upregulation of GIP-positive cells for sites B (both groups) and C (type 2 diabetes) post surgery (Fig. 1g, h). We observed significantly lower levels of GHRL mRNA after RYGB. The t tests also showed significantly lower levels of GHRL mRNA expression in post-surgery sites in both groups. Within post-surgery sites, we observed lower expression in the biliopancreatic limb vs the alimentary limb, but in the control group only (ESM Fig. 1). The ANOVA model showed significantly lower levels of SCT mRNA after RYGB and post hoc t tests showed significant between site differences. (ESM Fig. 1). There was a significant downregulation in all areas after RYGB in both groups except for alimentary limb in the control group. Between groups there was a significant downregulation in the biliopancreatic limb vs the alimentary limb (control group) and a significant downregulation in the common vs alimentary limb (ESM Fig. 1b). We observed no significant effects on NTS mRNA (ESM Fig. 1). The ANOVA model revealed significantly higher levels of NR1H4 (encoding the farnesoid X receptor) expression in the type 2 diabetes group. Post hoc t tests showed significantly higher levels of NR1H4 expression in the type 2 diabetes group vs controls in the peri-operative sample and in the alimentary limb (ESM Fig. 1). The ANOVA analyses showed significantly higher prohormone convertase 2 (PC2)-positive cell counts after RYGB as well as significant differences between post-surgery biopsy sites. Post hoc tests showed significantly higher cell counts in post-surgery sites in both groups. Within post-surgery sites, we observed lower cell counts in the common and biliopancreatic limb vs the alimentary limb, but only in the type 2 diabetes group (ESM Fig. 2). 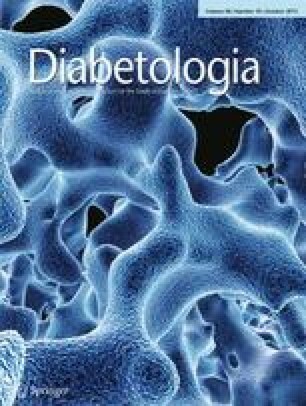 Here we provide information on the distribution and transcriptional activity of a number of enteroendocrine cells in the mucosa of the small intestine before and after RYGB in both obese patients with type 2 diabetes and normoglycaemic controls. Main findings include increased density of CCK-, GIP-, GLP-1-, PYY- and PC2-positive cells, reduced gene expression of GHRL, SCT and GIP and increased expression of GCG. This study is the first to compare human mucosal biopsies taken from the small intestine during RYGB surgery with endoscopically retrieved mucosal biopsies from the same individuals postoperatively. Of note, only areas B and D serve as proxy for area A after RYGB as they are very close (<8 cm) to the area that was designated A before RYGB. The use of enteroscopy allowed us to immediately preserve biopsies in suitable media, thereby stopping all biological breakdown and enzymatic processes and ensuring high-quality immunohistochemical analyses and minimal decay of mRNA. The unaltered level of CCK mRNA is in line with some previous findings  but is in contrast to the demonstration of increased CCK plasma levels after RYGB [5, 6]. However, these studies sampled plasma CCK levels in the postprandial state (or after OGTT) and in the present study biopsies were collected in the fasting state. GLP-1-immunoreactive cell density was increased, coupled with a corresponding increase in GCG expression. This increase in the density of GLP-1-producing cells in the common limb could be linked to an increased flow of nutrients and bile, since both bile , fatty acids, carbohydrates  and oligopeptides  are known secretagogues of GLP-1 and, thus, are potential stimulators of GCG expression. Similarly, our findings are consistent with the increased postprandial plasma levels of GLP-1 found after RYGB [10, 11, 12, 13]. PYY was the only hormone where the change in immunoreactivity was different between the two groups. The attenuated increase in the density of PYY-positive cells in the type 2 diabetes group could be a sign of a generally diminished L cell response in patients with type 2 diabetes, since PYY and GLP-1 are to some extent co-localised in the L cell , although GLP-1 density was increased in the type 2 diabetes group as well. The somewhat disparate findings for PYY and GLP-1 may reflect the recent identification of (at least) two populations of L cells—proximal cells with little PYY expression and distal cells with more PYY expression [15, 16] but nevertheless identical rates of GLP-1 secretion. In conclusion, this study is the first to describe the anatomical and transcriptional changes in enteroendocrine cells of the mucosa seen after RYGB in humans. The observed changes may play a role in the improved glycaemic and metabolic status experienced by most participants undergoing RYGB. Thus, the significant alterations in enteroendocrine cell distribution and expression of specific genes described in this study may help to understand some of the mechanisms behind the well-documented changes in plasma gut hormone levels after RYGB. We are grateful to our volunteers whose availability made this work possible. We especially thank L. S. Strange and H. Paulsen at the Panum Institute for performing the immunostaining as well as nurse D. G. Jørgensen from Hvidovre Hospital who assisted in contacting the volunteers. We would also like to thank Bariatric Group Hvidovre (S. Madsbad, D. Worm and D. L. Hansen) at Hvidovre Hospital for management of RYGB patients, the nurses at Gentofte Hospital for their work during enteroscopies and securing biopsy material and L. H. Jørgensen at Gubra Aps for assisting with the gene expression analyses. This study was supported by unrestricted grants from the Novo Nordisk Foundation and the Danish National Advanced Technology Foundation. NAR contributed to the study design, acquired, analysed and interpreted the data and drafted the manuscript. CDW, JP, BM, SJP, LSD and SSP analysed and interpreted data and revised the manuscript. EL, EPW, SUF and PV contributed to data acquisition and revised the manuscript. VBK contributed to the study design, acquired data and revised the manuscript. JJ interpreted data and revised the manuscript. JJH and TV contributed to study design, data interpretation and revised the manuscript. FKK conceived and designed the study, interpreted data and revised the manuscript. All authors approved the final version of the manuscript. FKK is the guarantor of the present work.